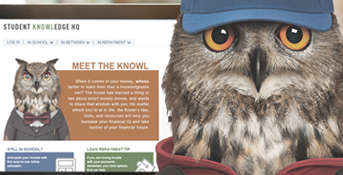 A comprehensive, mobile-ready, portal specifically designed to assist student borrowers. 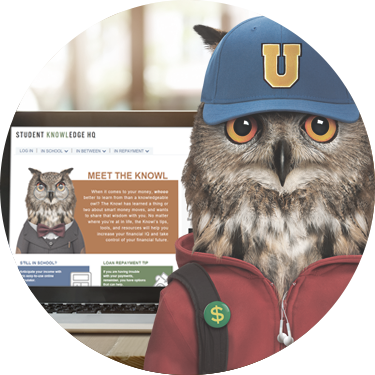 Student Knowledge HQ is led by the Knowl, an owl who’s knowledgeable about money, and is eager to guide your students toward success. The site is easy to use, mobile friendly and offers a 24/7 self-sevice option, as well as the option to live chat with our highly trained counselors. Student Knowledge HQ is there for students no matter where they are along their repayment journey—in school, during their grace period, or in repayment. Leveraging Inceptia’s Loan Summary, Grace Counseling Outreach and Default Prevention Outreach products, the portal allows borrowers to chat with Inceptia counselors and access tools and resources that will help them understand their existing federal loans, create a customized repayment plan, set up alerts, get answers to FAQs, and connect with their loan servicers.